English political economist and publicist; born in London April 19, 1772; died Sept. 11, 1823. The Ricardo family removed from Italy to Holland in the beginning of the eighteenth century or, perhaps, earlier, and its members appear to have become dignified and substantial members of the Jewish community of Amsterdam. Two generations later, with the drift of trade and finance from Holland to England, a branch of the family went from Amsterdam to London. Of David Ricardo's father, Abraham Ricardo, it is said that he went on a visit to England when young, and, preferring it to his own country, became naturalized and settled there. He entered the stock exchange, amassed a fortune, and acquired considerable influence both as a man of affairs and as a member of the Anglo-Jewish community. He married and became the father of a large family, of which David was the third child. David's early education was sound and practical. His father, from the outset, designed him for a financial career. As a young boy David was sent to a school in Holland, where he remained for two years. Upon returning to England he continued to enjoy the benefit of a common-school education until the age of fourteen, when his father began to employ him in stock-exchange business. As a youth he appears to have given evidence of those mental qualities which in fruition distinguished his later intellectual life—a taste for abstract and general reasoning, an insistence upon final analysis, an independence and vigor of thought, and a firm adherence to positive opinions combined with a singular candor and openness to conviction. Soon after the attainment of his majority young Ricardo married Priscilla Anne Wilkinson, a non-Jewess, and whether in consequence of this step or in general reaction against the rigid orthodoxy of his father's religious belief and practise, a rupture occurred between father and son extending even to business affairs. McCulloch states that young Ricardo actually seceded from the Jewish faith, but there is no evidence of any formal apostasy, and it is more reasonable to hold that virtual alienation resulted from marriage outside of the Jewish faith and that the severance of family ties followed. Ricardo must, however, as a member of Parliament, have taken the oath of allegiance on the true faith of a Christian. Thrown in the main upon his own resources, Ricardo soon displayed exceptional capacity in practical finance. In a few years he had established himself securely, and he rose steadily thereafter no less in wealth than in the estimation of his associates and in commanding influence in financial affairs. In so far as urgent business affairs afforded leisure, Ricardo's interest seems at first to have been held by mathematics, chemistry, geology, and mineralogy. He was one of the original members of the Geological Society, and fitted up a laboratory and made a collection of minerals. But McCulloch declares that he never entered warmly into the study of these sciences, and that he abandoned them entirely as soon as his attention was directed to the more congenial study of political economy. Although the sensational events which led up to and followed the bank restriction of 1797, as well as the ordinary transactions of his every-day life on the stock exchange, can not have failed to interest Ricardo in general financial principles, yet the determining impulse to economic speculation is said to have come from acquaintance with Adam Smith's "Wealth of Nations" in 1799. From the time when this work began to exert an influence upon him economic inquiries became the avocation of his life. 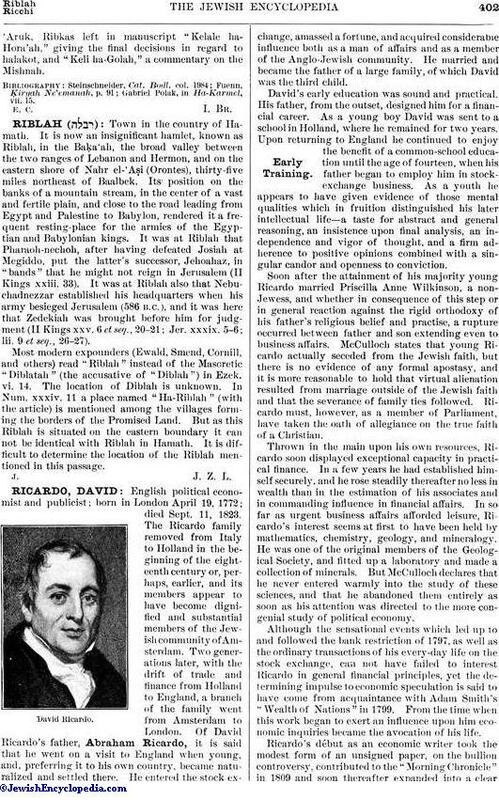 Ricardo's début as an economic writer took the modest form of an unsigned paper, on the bullion controversy, contributed to the "Morning Chronicle" in 1809 and soon thereafter expanded into a clearand forcible pamphlet. It led to intimacy with James Mill and to friendship with Malthus and Bentham, and upon the incorporation of its substance into the Bullion Report of 1810 established Ricardo as an authoritative and convincing exponent of monetary principles. The corn-law controversies of 1813-15 brought Ricardo again conspicuously to the fore, first as a pamphleteer advocate of free-trade principles, in opposition to the protectionist leanings of Malthus, and thereafter as an exponent of a systematic theory of economic distribution and fiscal incidence. Closer intimacy with James Mill, active discussions with Malthus and Trower, and retirement from the stock exchange to the tranquil ease of a Gloucestershire country-place in 1814, all tended to broaden the range of his economic thought, and culminated logically in the publication of his "Principles of Political Economy and Taxation" in 1817. Thenceforth until his death in 1823 Ricardo remained the dominant figure in English economic circles. As early as 1821 McCulloch could declare that the Ricardian theories—"the new political economy" as Malthus termed them—were assented to by "all the best economists in the country." 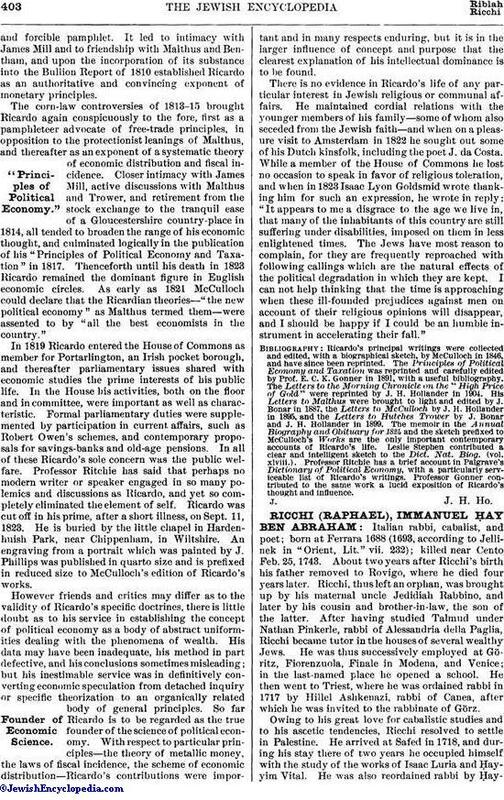 In 1819 Ricardo entered the House of Commons as member for Portarlington, an Irish pocket borough, and thereafter parliamentary issues shared with economic studies the prime interests of his public life. In the House his activities, both on the floor and in committee, were important as well as characteristic. Formal parliamentary duties were supplemented by participation in current affairs, such as Robert Owen's schemes, and contemporary proposals for savings-banks and old-age pensions. In all of these Ricardo's sole concern was the public welfare. Professor Ritchie has said that perhaps no modern writer or speaker engaged in so many polemics and discussions as Ricardo, and yet so completely eliminated the element of self. Ricardo was cut off in his prime, after a short illness, on Sept. 11, 1823. He is buried by the little chapel in Hardenhuish Park, near Chippenham, in Wiltshire. An engraving from a portrait which was painted by J. Phillips was published in quarto size and is prefixed in reduced size to McCulloch's edition of Ricardo's works. However friends and critics may differ as to the validity of Ricardo's specific doctrines, there is little doubt as to his service in establishing the concept of political economy as a body of abstract uniformities dealing with the phenomena of wealth. His data may have been inadequate, his method in part defective, and his conclusions sometimes misleading; but his inestimable service was in definitively converting economic speculation from detached inquiry or specific theorization to an organically related body of general principles. So far Ricardo is to be regarded as the true founder of the science of political economy. With respect to particular principles—the theory of metallic money, the laws of fiscal incidence, the scheme of economic distribution—Ricardo's contributions were important and in many respects enduring, but it is in the larger influence of concept and purpose that the clearest explanation of his intellectual dominance is to be found. There is no evidence in Ricardo's life of any particular interest in Jewish religious or communal affairs. He maintained cordial relations with the younger members of his family—some of whom also seceded from the Jewish faith—and when on a pleasure visit to Amsterdam in 1822 he sought out some of his Dutch kinsfolk, including the poet J. da Costa. While a member of the House of Commons he lost no occasion to speak in favor of religious toleration, and when in 1823 Isaac Lyon Goldsmid wrote thanking him for such an expression, he wrote in reply: "It appears to me a disgrace to the age we live in, that many of the inhabitants of this country are still suffering under disabilities, imposed on them in less enlightened times. The Jews have most reason to complain, for they are frequently reproached with following callings which are the natural effects of the political degradation in which they are kept. I can not help thinking that the time is approaching when these ill-founded prejudices against men on account of their religious opinions will disappear, and I should be happy if I could be an humble instrument in accelerating their fall." Ricardo's principal writings were collected and edited, with a biographical sketch, by McCulloch in 1846, and have since been reprinted. The Principles of Political Economy and Taxation was reprinted and carefully edited by Prof. E. C. K. Gonner in 1891, with a useful bibliography. The Letters to the Morning Chronicle on the "High Price of Gold" were reprinted by J. H. Hollander in 1904. His Letters to Malthus were brought to light and edited by J. Bonar in 1887, the Letters to McCulloch by J. H. Hollander in 1895, and the Letters to Hutches Trower by J. Bonar and J. H. Hollander in 1899. The memoir in the Annual Biography and Obituary for 1824 and the sketch prefixed to McCulloch's Works are the only important contemporary accounts of Ricardo's life. Leslie Stephen contributed a clear and intelligent sketch to the Dict. Nat. Biog. (vol. xlviii.). Professor Ritchie has a brief account in Palgrave's Dictionary of Political Economy, with a particularly serviceable list of Ricardo's writings. Professor Gonner contributed to the same work a lucid exposition of Ricardo's thought and influence.